Every once and a while, someone has a mare that I covet. Yes, covet. Have to have. It’s a flaw, I know and readily admit it. Mistral was one of those mares. She was imported by Zondervan Farm in 1999. When I saw her picture and read her pedigree, I immediately filed her away as a mare I needed in my program. Well, as fate would have it, she spent her Golden years at Shooting Star Farm. Mistral received her ster status in Holland in 1998, placing first in her class and was invited to the National Mare Show in Ermelo, where she was named Reserve Champion. 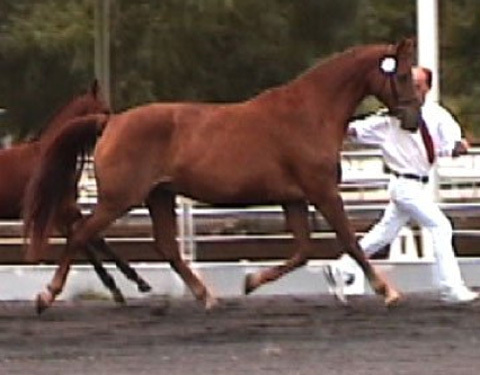 At the 2000 Keuring in Houston, Texas, she received her provisional keur designation and was named best mature mare. The jury praised her for being a strong, modern mare with an outstanding, powerful hind leg. One of the big reasons I coveted this mare is because of her pedigree. Mistral’s sire was the stallion, Olympic Vincent. He ranked in the top of the dressage index for years. He also had an impressive dressage career in Holland, most notably being named Dutch Champion at the 1989 Grand Prix, at Haaksbergen. Modern breeders may recognize his son, Cabochon, more than they do Vincent himself. However, Vincent continues to show up in the dam lines of top young horses, especially crossed with Jazz blood. On her dam’s side, Mistral carries the blood of the very valuable, El Corona, who died young, but was a prime example of the early KWPN dressage-breeding niche, Amor x Doruto. To top this off, Mistral has Doruto again in her bottom line, Vincent x El Corona x Lector x Doruto. For anyone who has studied Dutch pedigrees as much as I have, this is a dream pedigree for a foundation mare. Mistral‘s first foal, a colt by Welt Hit II, advanced to the Second Ring in the KWPN Stallion Selection in 2002. He was a semi-finalist in the PAVO Cup in August, 2003. For Zondervan Farm, Mistral produced the licensed stallion,Thatcher, also sired by Welt Hit II, and the top ten ster mare, V Eight, by 00 Seven. Between the “V” year and the “H” year, Mistral produced no foals. We have been fortunate enough to get two foals from this great old mare so far, Ignazio SSF, by Don Tango B, and Jubilation SSF, by UB-40, both of whom were the high scoring foals in New England at their respective keurings. She produced a second UB-40 colt for us in 2015, Kublai Khan SSF. Kublai is an absolutely outrageous mover, so we had retained him as a stallion prospect. Unfortunately for us, he just didn’t get tall enough. Our bad luck turned into good luck for Kublai and Corinne Foxley, however. Kublai has a really exciting dressage career ahead of him. Sadly, we lost Mistral in the late winter of that year.